I had a minor jazz-history epiphany last Sunday at The Ear Inn (326 Spring Street, Soho, New York City) early in the second set, when past and present coincided. The Ear Inn, for those who have never been there, isn’t a huge space (it is New York real estate) but everyone gets comfortable. The second set at the Ear began with that Sunday’s edition of the EarRegulars: charter members and co-founders Jon-Erik Kellso and Matt Munisteri on trumpet and guitar, respectively; Greg Cohen on string bass; Michael Blake (a risk-embracer who loves Lester Young) on tenor saxophone. For good reasons, musicians often come to the Ear — not only to sit in, but to enjoy the sounds. Last Sunday the musicians were bassist Jon Burr and singer Lynn Stein, reed master Dan Block, then (slightly later) tenorist Nick Hempton and drummer Dan Aran (toting a snare drum). The observant Nan Irwin was there, also, keeping everyone reasonably honest. Then, Jon-Erik invited Nick and Dan to join in, and what marvels ensued! At some point during those final three performances, I looked at the bandstand, saw the musicians and their instruments — trumpet, guitar, bass, drum, and three tenor saxophones jammed in (my choice of words is no accident) shoulder to shoulder, having a good time. I thought, “Where have I seen this before?” And — as my UK friends might say — the penny dropped. Basie. 1938. The Famous Door. Some will know the story of that Fifty-Second Street paradise. A small club with a low ceiling, it had been host to a variety of bands in the middle Thirties but — with no air-conditioning — had always closed in the summer. John Hammond, always full of ideas, paid for the installation of an air-conditioning system so that his favorite band, led by one Bill Basie from New Jersey, could play there in the summer. The Basieties had to play softly at first, but it’s clear from the radio airshots that exist — not enough for my taste! — that they had a wonderful time and made irreplaceable music. Yes, the physical resemblance between The Famous Door and The Ear Inn is not exact, but the two places share the same ebullient spirit, with brilliant musicians improvising at the peak of their powers in a small space. Henceforth, I dub 326 Spring Street THE FAMOUS EAR. It well deserves the new name! 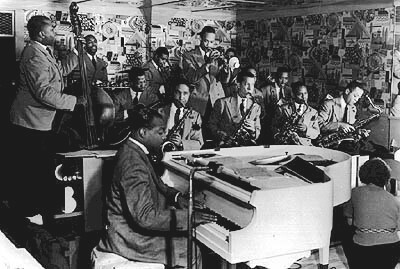 And to finish the thought: the EarRegulars continue to swing as beautifully and as joyously as the 1938 Basie band. No doubt about it! P.P.S. On June 12, I was able to savor Abigail Riccards and Michael Kanan, creating music with delicacy and strength — then I drove from Brooklyn to Soho to capture these five performances, hilariously creative. This, to me, says only one thing: JAZZ (emphatic pause) LIVES (exultant exclamation point)! This LADY is well beyond GOOD — as the Swinging Fundus (new to me) live up to their name, and helped immeasurably by master Dan Barrett, take the Gershwin song through a number of its jazz permutations, helpfully delineated in subtitles — ending with Lester Young’s 1936 solo. Deep thanks to the musicians for their easy heartfelt playing and to “ulivids” on YouTube for sharing this with us!